Over the course of a season I am fortunate enough to experience a wide variety of waters and observe a large number of anglers, weather from the guides’ perspective or as a mate, sharing a day on the river with another. 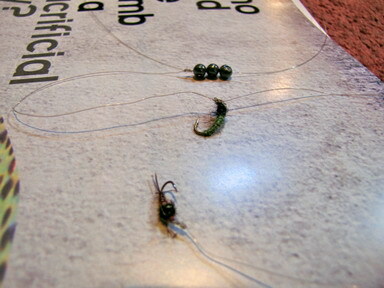 Some are absolute greenhorns, whilst others rank amongst the countrys top fly fishermen. Watching others teaches you a lot, whether they are gun anglers or absolute beginners, there’s something to learn from every approach. Nymphing is one of my favourite techniques, more so than fishing dry and so I am always looking for a way in which to improve my approach. The following are a couple of ideas which have opened my mind to the many possibilities of fishing down below and can be built upon from a number of levels. A brief introduction to ‘contact nymphing’, or improved, short line nymphing. Whilst indicators certainly have their time and place, and do so much more than just alert the angler to the take, I’m surprised at how reliant many anglers become on indicators whilst nymphing. Remove the indicator and watch their confidence drop, although this could be a good thing, for they begin to strike at the slightest indication that their fly may be eaten. Removing your indicator is the first step to becoming a more astute nymph angler, for you then turn your endeavour from more so a visual activity into a sensical one. Longer leaders and more weight can now be employed to get your imitation down into the bingo zone, an area which may not have been achievable before whilst maintaining a reliable visual indicator. You are now utilizing a combination of senses to detect the moment of the take, rather than just watching for a sign that may be so subtle that you do not pick it up anyway. The first step to contact nymphing is to be able to ‘feel your fly, and the weight of the line. I often introduce clients to this with heavier streamers to provide a resistance they can easily feel, and get them to lead a short line through a riffle by tossing it upstream on a 45 degree angle, and dragging the streamer back through via a high rod tip. 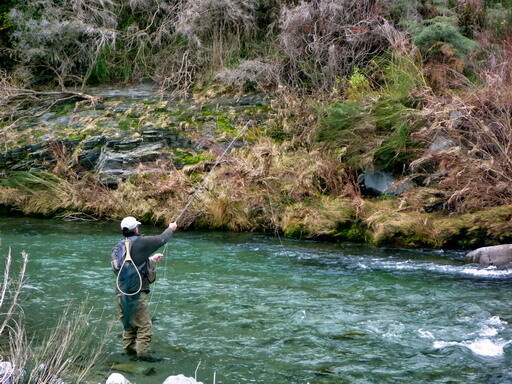 Your rod tip is not following the line, but subtly leading it downstream. 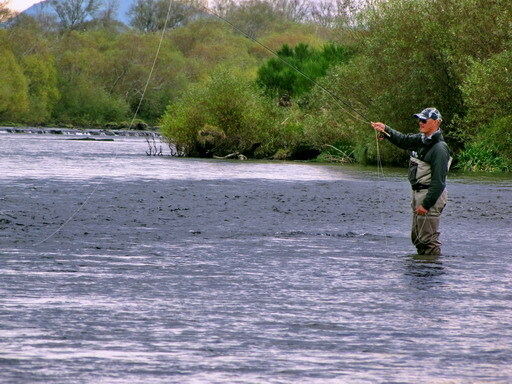 To begin, once the cast is made, do not follow through to the water as you normally would, instead, raising the rod tip a few inches as your presentation falls. Follow this with a couple of short, controlled strips of the line to remove any sag, or slack line which may develop at the point where your fly line touches the water. Immediately you will notice that what would have become a saggy ‘L’ shape in your line now resembles a tight curve from your raised rod tip to the point at which your line enters the stream. 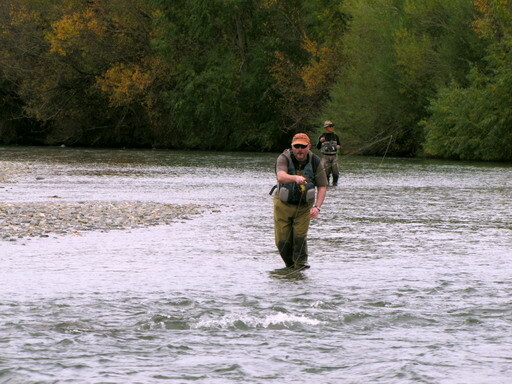 Immediately begin the downstream swing of your rod, leading the line as it follows in the drift. Strip in any slack line as it develops to maintain a consistent curve below the rod tip. This tight curve acts as both a lifeline to your nymph (any bumps or knocks will be felt if constant tension is maintained) and a visual indicator of the slightest of takes (if the curve tightens at all, strike). Often you are left wondering whether you saw, or felt the tightening of the line as a fish hits. It is important when contact nymphing to retain an anchor of fly line upon the surface. The grip of the surface film will prevent your line from sliding back beneath your rod tip, and reduce the effect of wind on your curve. Short line = shorter anchor, whereas longer line requires a longer anchor accordingly. Another important note is that due to the rod tip remaining often at chest height or above, I use the rod tip more so to remove any slack from the line upon the take, and it is the downward strike of the line hand which hooks the fish. Thus said, when stripping line during the drift, I prefer shorter, quicker retrieves so as my line hand spends more time near the rod hand, to enable a quick and effective downward strike. So next time you are working a riffle with little joy, remove that indicator, extend that tippet and give contact nymphing a go. Your success rate will thank you! Q. Whats the difference between czech and contact nymphing? A. A longer line, and arguably more control. The most common way of getting deep is to add weight to the fly. With the advent of tungsten beads, smaller flies can now be fished deeper, without the added bulk of layers of lead. The home tier can now achieve success in a wide range of waters by employing unweighted nymphs to fish near the surface, lightly weighted ties for the wider, shallower riffles and flatter waters, a tungsten bead (or two) for the deeper, or faster runs, or really load their tie with an underwrap of lead and an oversized bead to really plunge the depths. However, this means that for any one size of a given pattern you may require three or four different weights, according to their purpose, and for the average tier with limited vice time, or those prone to losing more than a few flies this may not be achievable. Over the past couple of seasons I have been employing split shot on and off to present the same tie to fish over a variety of depths. With practice, it only takes a few seconds to add a shot or two or remove it according to the conditions, without the necessity of remembering which flies are heavily loaded and which are medium weight. Fishing a season or two ago with Chase Jablonski, Chase demonstrated the benefits of utilizing good quality, soft lead shot. He explained that unweighted nymphs take but a moment to tie and by favouring a couple of smaller shot over a single larger piece, he can easily explore a range of depths in only moments. If his moderately weighted rig needed extra weight for that heavier drop off, the addition of another piece of shot would get him there, and the moment he approached the shallower tail – out above, it takes but a moment to remove the recent addition and be back in the bingo zone. Attaching shot is easy, and requires but a pair of forceps or needle nosed pliers. Firstly, I split my tippet several inches from the fly and rejoin it with a simple blood knot above which I attach my shot. This will prevent the shot from sliding down upon the fly, and more importantly, will ensure that whilst the weight may bump along the bottom, the fly rides slightly above, avoiding unneccessary foul ups along the streambed. Using good quality, soft lead will prevent any nicks or abrasion of the tippet, for the edges are less rugged, although it is good practise regardless to check your leader often for any weak spots. Simply hold the tippet tight and place it well down into the groove on the shot. Applying steady pressure with the forceps will close the shot snug around the line resulting in instant weight. As mentioned, I regulate the depth by employing two or more smaller shot over one larger, more awkward piece, and also find less water disturbance when splashing down smaller pieces. Maybe that’s just me. To remove shot, simply hold the leader tight and squeeze the groove the opposite direction using your forceps – the gap should simply open up so you can remove, and again check your tippet for abrasions. Easy as. As my friends joke, I must either not care about my nymph selection, or be one of the world’s most limited fly tiers. The former is pretty much correct. Why give the fish so much detail so as to find fault in your fly? After years of studying the ecology of my local trout streams, and tying hundreds of different, intricate nymph patterns I realised that the food on which our opportunistic trout feed is often small and dark, or larger and green. I have come up with a couple of basic patterns which I have confidence in and believe, if fished well, will account for most fish. They are all tied slim to slip through the water column with ease, and durable to take the knocks both from fish, and from bounching amongst the streambed. Find a couple of patterns which do it for you, are quick to tie and are durable then learn to fish them in a number of productive ways. You will do well. Keeping that fly out there amongst the fish. When contact nymphing I’m never retrieving too much line, and so can often just lift the line from the water, and drop it back upstream again. One false cast or so maximum. Implementing single handed spey techniques such as the snake roll or snap T will assist in rapid change of direction, enabling you to get your fly in back the water quicker – I’m yet to catch a fish whilst false casting, and my flies remain wet, assisting their sink rate. Recently I was nymphing a riffle with a friend who always seemed to be whipping his fly around in the air, to the point where I realised that I was getting up to three or more full drifts than him per minute! The more time your fly is in the water, drifting at the correct depth the more chance you have of catching fish, simple. This proved itself on that day with my nameless friend and I’m glad to report he is now endeavouring to minimise the time his fly is not in the drift. The above are just a couple of random thoughts from the past season or two, and are certainly nothing new. Take from them what you will and improve on these ideas as you can. Get out there and do it, push your comfort zone and enjoy your time on the water! Copyright 2011 Chris Dore. All rights reserved.